September, with its back-to-school vibe, always makes me nostalgic. Tonight, with the opening of the Toronto International Film Festival, I look back on great moments in my film fest history. VIFF 1994: Krzysztof Kieslowski premiered Three Colours Red and was a special guest of the VIFF. I think they also showed a few of his Decalogue films in a special presentation. That year I was a film school drop-out and volunteered at the Hospitality Suite. TAOS 2002: Room, the short film I produced, directed by Cameron Labine, played at the Taos Talking Picture Festival. It was the first festival I travelled to and I met amazing people, including Chip Hourihan, producer of Frozen River. Have to say it was a thrill being at a party when Goldie Hawn and Susan Sarandon were in the next room. FilmExchange 2006: My first feature, “Love and Other Dilemmas“, directed by Larry Di Stefano and written by Deb Peraya played this intimate Canadian festival. It felt like coming home because LAOD had been selected by the NSI’s Features First program. I discovered that Terry David Mulligan is a gracious host and wine connoisseur. Check this space for an exclusive blog for SuperU from TIFF 08 by Marguerite Pigott, Super Channel’s Creative Development Representative for the province of Ontario. In addition to her work for Super Channel, Marguerite is also an independent consultant focusing on script development and project marketability. Another producer gave me this great piece of advice: Take good stills for your movie. For my very first short film, ROOM, I arranged for gallery shots of the four lead actors specifically for a promotional campaign to send to film festivals. I did the same thing with my feature film, Love and Other Dilemmas. On a day when Gabrielle Miller and all of the leads were working, we carved out 10 minutes for each of them in costume with photographer Satu Bell. You just need to have a plan. 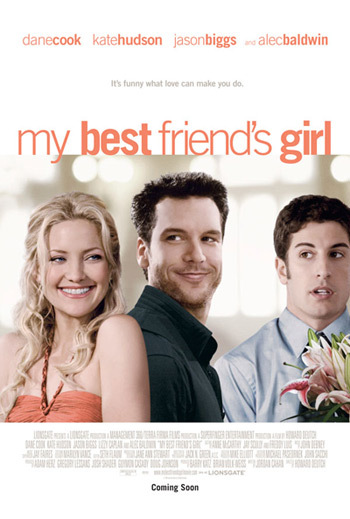 So why do most posters for romantic comedies show disembodied heads staring off into the distance when we’re meant to believe they’re supposed to be looking into each other’s eyes? You can’t convince me that the characters are supposed to be in love when they don’t appear to be in the same room. And with millions of dollars, you can’t plan ahead a little? Get the well-paid actors to stand still for a minute. Have them pose together. The latest culprit, is the upcoming, already forgettable, My Best Friend’s Girl. Check out Dane Cook’s MySpace page for a rant that is probably funnier than the movie.